We are a modern, family dental practice with a focus on relationship-based care. Our goal is to enhance self-confidence, help people get over their fears of the dentist and inspire everyone to smile more! 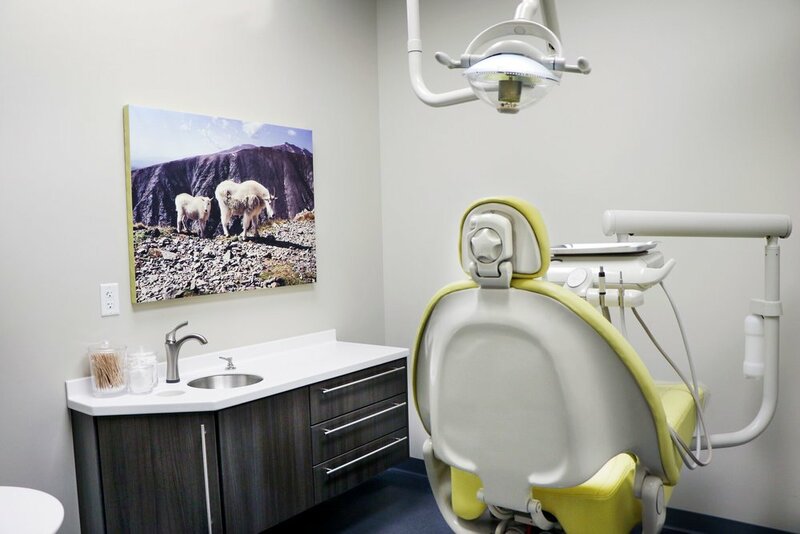 At Abundant Smiles, we know that your mouth is a part of the rest of your body, which is why we strive to keep up to date with the latest technology. We provide exceptional care, while using materials that are bio-compatible and non-toxic, along with advances to minimize radiation. At your first appointment, we want to take the time to get to know YOU! We want to know more about your overall health, previous dental experiences and goals for your smile in order to provide you with the best care possible. Once we determine what motivates you, we will take necessary photographs and x-rays. At Abundant Smiles, we use reduced-radiation digital radiography and caries detection by a non-radiation fluorescence camera. This helps us be as minimally invasive as possible and prevent the need for more extensive treatment, all while reducing your exposure to radiation. Once we have all of the information we need, an exam will be completed and together we will create a treatment plan that is best for you. Our goal is to work with you to provide you with the tools needed to achieve life-long oral health. After you have had a chance to get to know Dr. Jessica and all questions have been answered about necessary treatment, a cleaning will be completed to give your pearly whites that sparkling fresh feeling. Some patients require deeper, more extensive cleanings to get the gums healthy. If this is the case, your cleaning may need to be started at the next appointment. The majority of your treatment needs can be provided right in our office. We provide our patients with routine cleanings, exams, whitening and oral cancer screenings. Additionally, we complete standard dental care such as: extractions, root canals, mouth guards and Invisalign and we place tooth colored, non-metal fillings and crowns. We know the dentist can be a scary experience for some, so we also offer anti-anxiety options to help you feel more relaxed and comfortable. Abundant Smiles started as a vision and dream of Dr. Jessica's. Growing up in a family of small business owners, she always knew she wanted to open a dental practice; she just had to find the right location! In July 2015, Dr. Jessica moved from Wisconsin to Colorado after falling in love with the laid back lifestyle, the people and of course the year-round sunshine. This is when she realized it was time to open her dream practice. Dr. Jessica knows that each patient is more than just another set of teeth. She understands that each patient has individual wants and needs. This is why she makes it her priority to listen and collaborate with her patients to develop the best possible treatment plan with them. When not in the office, Dr. Jessica volunteers weekly at a no kill animal shelter. She has a huge place in her heart for rescue animals, which is how she ended up with her two cats, Keeks and Miska. Dr. Jessica also enjoys yoga, being in the mountains, hiking and traveling as much as possible. Her bucket list includes completing all the 14ers in Colorado and traveling to Thailand where she hopes to spend time at an elephant rescue. Dr. Jessica is a member of the American Academy of Facial Esthetics, the Colorado Dental Association, the Academy of General Dentistry and the American Dental Association. Dr. Plaza may be the newest addition to the Abundant Smiles family, but he has been the office’s biggest supporter since the beginning. He helped Dr. Jessica build her dream practice after convincing her to move to Colorado, and is excited to now be working along side her. Dr. Plaza strives to construct a comfortable and personalized approach to dentistry. He believes that good communication and patient participation are the keys to a successful treatment plan. Utilizing proven methods and modern techniques, Dr. Plaza takes prides in creating and maintaining healthy smiles! In his spare time, Dr. Plaza enjoys everything Denver has to offer. Whether skiing in the winter, climbing in the spring or hiking in the summer, Dr. Plaza spends most of his free time in the beautiful Rocky Mountains. When not in the mountains, you can find Dr. Plaza playing soccer, playing a variety of instruments, or cooking a delicious meal. Dr. Plaza is a member of the American Dental Association, the Colorado Dental Association and the Metro Denver Dental Society. Pampa is our official office greeter and registered emotional support dog! We adopted Pampa from an animal shelter in September 2018. She has quickly become a loved addition to our Abundant Smiles family. In Pampa’s free time she enjoys playing at the dog park and chasing squirrels. She can’t wait to welcome you to our office! Your mouth is a part of the rest of your body. This is why we find it so important to help you keep your mouth healthy! No one ever wants to have a tooth removed, but if it's necessary there are many options to replace your missing tooth and return your mouth to full function. Cavities can lead to discomfort and pain. It is important to take care of fillings as soon as possible to stop the cavity from progressing further. When cavities are removed, the missing tooth structure may be restored with a tooth-colored filling or may sometimes require a crown. Invisalign offers a clear and removable solution to braces to help straighten your teeth and give you a smile you have always dreamed of! We offer same day emergency appointments for those unexpected accidents and tooth aches. One of the most rewarding aspects of dentistry is enhancing patient's self confidence. We offer many cosmetic procedures to help boost your smile. We understand everyone has had unique previous dental experiences, some of which may have been unpleasant. We pride ourselves on helping patients overcome dental anxiety. Botox has multiple applications. Not only can it smooth lines and relax muscles, it can also be used to treat chronic headaches, migraines, TMJ pain and muscle aches. Have more questions? We would be more than happy to sit down with you and discuss your individual questions and needs! We accept most major PPO insurance plans including, but not limited to, those from Delta Dental, Metlife, United Healthcare and Aetna. We will happily submit insurance claims on your behalf to any other plan that allows you to see an out-of-network provider. For those patients without insurance, we are happy to offer an in-house savings plan to help make treatment more affordable! Ask us for more details. In order to provide the best dental care at the most economical cost, payment for services are due at the time they are rendered. We accept cash, check and credit card payments. In many cases, dental insurance will help pay for a portion of your dental care. Insurance is designed to aid you with the expense, not completely eliminate it. If you provide us with your insurance information, we will gladly bill your insurance carrier for you. Every effort will be made to closely estimate your co-payment and deductions, but the ultimate responsibility of any unpaid balance is yours. Please understand that insurance is a contract between you and your insurance carrier. If an insurance carrier has not paid within 60 days of billing, any unpaid fees are due and payable in full from you. Have questions or want to schedule an appointment? Give us a call or fill out the form below and we will be in touch soon! Although we are not in the office Wednesdays we are available by phone or email from 8AM-12PM. Conveniently located between the Sunnyside neighborhood and the Highlands!